Beautiful property set On lake Louise, connected to 2 other lakes. Waterfront exposure with boat dock. 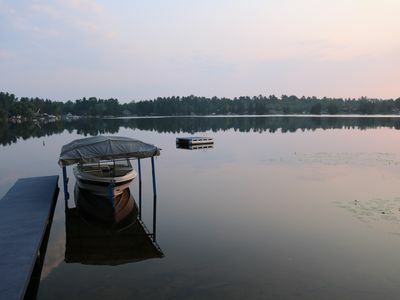 Fishing, waterskiing, jet skiing,kayaking, canoeing, swimming, raft, And floatation devices supplied, fire pit, gas grill on 14x22 deck, cable an internet provided,cottage fully furnished including all kitchen supplies. You can walk or jog around Lake Mary. Activities with them 20 minute drive white water raft thing sunset viewing from Pine Mountain,, fine dining at Mexican, Italian, Oriental, restaurants also movie theaters. Available in the summer months the big John IromMine tours including gift shop.